Most Cover crops are not edible unless cooked. Can someone please tell me which are the cover crops that are best/tasty for human consumption? Legumes are the best for both a cover crop and human consumption. Those include groundnuts, pigeonpeas, chickpeas and soya. These crops will rejuvenate the soil by returning nitrogen to the soil as well as increasing soil health over time. You might try this tool. pages 135-149 in 21st Century Greens has quite a bit of information about eating cover crops. You certainly provide a mine of information about cover crops on your website! Like you I have been trying to help for many years but my efforts have been directed towards helping poor people in developing countries. 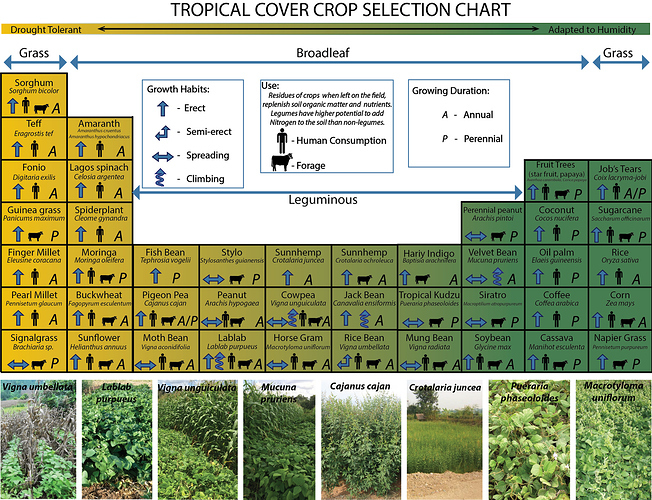 Cover crops seem to be an answer to the threat of climate change in Africa which is already affecting harvests. I will send you requests about info on cover crops that I am receiving but cannot really answer! This 21st Century Greens looks like a wealth of info. Thank you for making it available on-line. I am in northern Ghana, working with the Konkomba people. They have flooding for 4 months then water becomes scarce and no rain for the remainder of the year. Very, very hot here. Do you know anything about how to obtain valves for tubing for hose irrigation systems that use an elevated rain barrel with a system of hoses to irrigate gardens? I’m trying to find the valves in USA and then have them brought to northern Ghana. If the flow depends on the height of the barrel you do not really need a valve at all! If the tubing near the barrel is flexible you just have to raise it high enough and the flow will stop! Here is a little infographic we’ve been working on at ECHO, it’s a just a simple starting point for selecting the right cover crops for your particular context. It needs some revision I think, but it’s simple enough!